Chondromalacia translated literally means soft cartilage. The term “chondromalacia- patellae” (CMP) means soft cartilage under the knee cap. 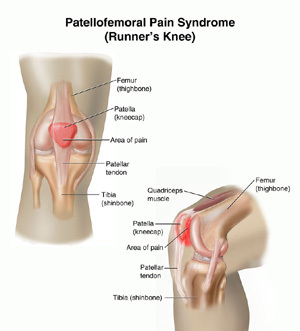 Although some doctors still use the term to refer to runner’s knee, it is gradually being replaced by the term “Patello-femoral pain syndrome”, because it more accurately describes the affected area. The patella-femoral region encompasses the bones, joints, tendons, ligaments and muscles of the knee. The primary symptom is non-specific pain in the front, behind or around your knee. It may cause limping and the pain may extend into the muscles of the upper leg. Usually the pain occurs during any activity. Although we may think of it as “runner’s” knee, just walking around can be painful. In most cases, the severity of the pain increases when walking up or down stairs. You may have problems bending your knee. The area may feel warm to the touch. There may even be pain when you are at rest. Swelling sometimes occurs, but not always. Injury or overuse is the most common cause. But, there are many other conditions that can cause pain in the knee area, include tight hamstrings, quads and/or calf muscles. Misalignment of the knee cap, bowed legs, knocked knees or flat feet could be the underlying cause. Irritation or inflammation of the joints or soft tissues underneath the knee cap may have occurred due to overuse, being overweight or due to arthritis. In some cases, the pain does not originate in the area, but is caused by hip or back problems. Any problem that affects the feet can cause knee pain. Wearing the wrong shoes for sports or other activities can cause knee pain, too. If the pain is due to overuse, the RICE method of treatment is most commonly recommended. RICE is an acronym for rest, ice, compression and elevation. Most people understand rest, ice or cold compresses and elevation. But, compression may be a new term for many. When it comes to acute (due to injury or a single incident of overuse) or chronic (pain occurs frequently over time due to frequent overuse or another cause) knee pain, the idea of compression is to provide additional support to the knee joint. ACE bandages are sometimes recommended for acute pain, but they are uncomfortable and limit mobility. A knee wrap, strap or brace provides support and compression, without limiting mobility. They can be worn during sports or other physical activities. Magnets and gels are sometimes included to provide additional therapeutic benefits. Cho-pat, Royce, KneedIT and Wellgate are some of the brands available. KneedIT braces provide support under the knee cap. The Cho-pat Dual Action Knee Strap provides support underneath, above and behind. Royce and Wellgate brands provide all around support, as well. The braces cover a larger portion of the knee area. Wellgate is designed for women and includes a gel support that contributes to normal knee movement. The Royce Wraparound Hinged Knee-brace provides maximum support for the outer knee area with aluminum inserts. In addition to wearing a brace to relive the pain of chondromalacia, be sure that your shoes are properly designed for your activities. Replace them when they start to wear down and be sure that they fit well, too.